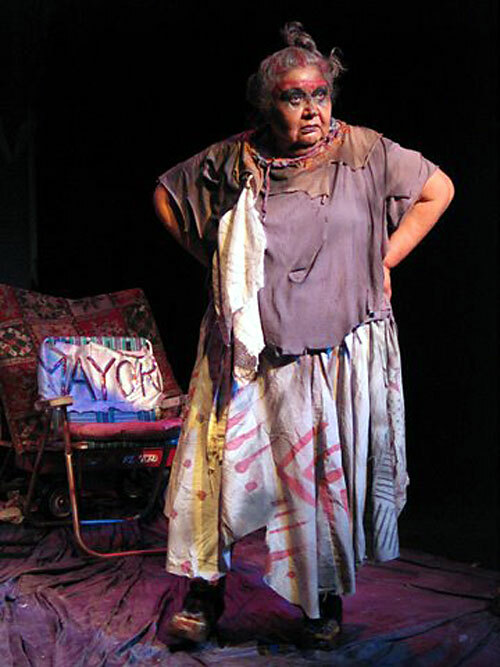 Using Brecht’s “Mother Courage” as a jumping off place, Muriel Miguel of the Spider Woman Theater Ensemble embraced the war torn, twisted reality of a native woman worming her way from one war to the next; with only a sales pitch from day to day to keep herself alive. Performed at NOZEM: First People’s Performance Space at Trent University, Peterborough Ontario, Canada, huckstering was the name of the game. Red Mother’s only companion a blue broomstick bearing the head of a horse. Talking to it like a child, Red Mother’s sales pitch led her from one catastrophic event to the next; an unsustainable psychological blitz of a damaged human being, with a deep distrust of being human in an inhuman world. Do Unto Others What They Have Done To You, pay any price, bear any burden, sell whatever you can whenever you can; including your own daughter to keep yourself alive. Surrounded by the yard sale of her junk shop, and wearing a blemish of ghost-like white makeup, Miguel exuded energy: flip flops into despair, quick silver revelations to get her off the hook, rat gut humor. Red Mother’s unsustainable distrust of being human revealed the corrosive erosion of a life long battle to keep herself alive; a nightmare of despair. Nightmares have a way of occupying the mind with a severe inability to put up a defense. 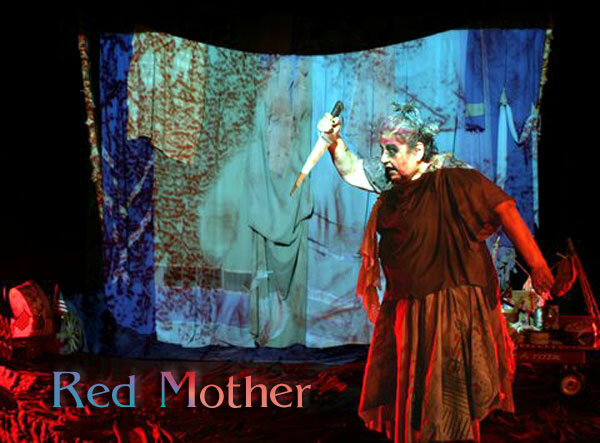 At the height of her pitch an illusive dream image of a figure riding a horse was projected like a ghost on the screen behind Red Mother. With a frenzied outburst of energy, Miguel danced around the stage; a bruised, jingle jangled matriarch, struggling with her despair. The burden of being alive had become insufferable. The sales pitch eroded whatever defenses she had left; revealing self destructive madness imploding into frenzy. Ned Bobkoff was a director, and a teacher who worked with performers from all walks of life in a variety of cultural and community settings throughout the United States and abroad. He was also a writer, columnist and Senior Writer for Scene4. For more of his commentary and articles, check the Archives.